The was a lot of discussion recently about the episode of NBC’s This is Us, which implicated a faulty switch on a Crockpot® in the death of the family’s beloved patriarch, Jack Pearson. 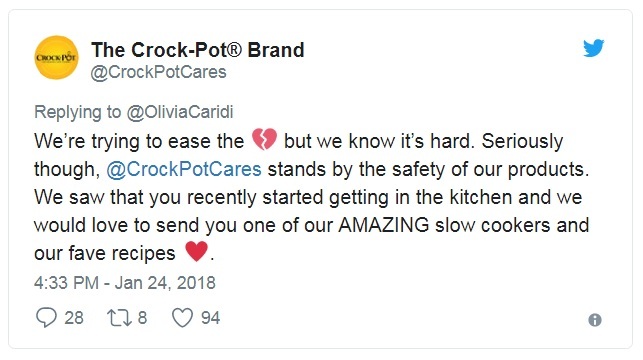 The manufacturers opened a Twitter account to respond to angry fans, and it issued a lengthy statement defending its product and asking NBC for some help to correct the record. This is probably as good as the manufacturer could do. This unfavorable depiction is not trademark infringement or even dilution. The use, while unfortunate from the trademark owner’s standpoint, is protected by the story tellers first amendment rights. While a disclaimer would be a nice gesture, it is not a legal requirement. Other trademark owners facing abuse or misuse of their products have similarly found that there is not much legally that the brand owner can do. Several years ago, the Emerson Electric, the manufacturer of Insinkerator waste disposers was upset when the heroine of the TV series Heroes (also by NBC) deliberately put her hand in their waste disposal to demonstrate her recuperative power. Emerson sued to mixed public reaction, and while it did get a concession by NBC to edit the depiction going forward, it eventually dismissed the case. Many years ago Caterpillar, upset with the use of its bulldozers by the villains in the movie George of the Jungle II to destroy the jungle, sued Disney. However, the suit did not get far. See, Caterpillar Inc. v. Walt Disney Co., 287 F. Supp. 2d 913 (C.D. Ill. 2003). Around that same time, Wham-O, maker of the iconic Slip ‘n’ Slide, sued Paramount Pictures for the misuse of the toy by the title character in the film “Dickie Roberts: Former Child Star,” and didn’t get very far. See, Wham-O, Inc. v. Paramount Pictures Corp., 2003 WL 2300526 (N.D. Cal. 9/29/03). Trademark protection offers scant protection when bad things happen to good brands. Trademark owners are best off fighting bad percent at the court of public opinion, rather than a court of law.